Home > Lifestyle > Ergonomics > Instinctive Sleeping – Are Pillows Necessary? Instinctive Sleeping – Are Pillows Necessary? Chimpanzees and their common ancestors have been sleeping without pillows for millions of years – do we really need one? Humans are one of many species of primates – ancestors that lived in the trees of tropical forests. With the exception of humans, most primates live in tropical regions of Africa, Asian and the Americas. The earliest primates go back nearly 60 million years – primates have been sleeping without pillows for a long time! Great apes (that’s us) are unique in that they build sleeping nests, or beds. Other primates, like Chimpanzees sleep on branches. Chimpanzees build their nests from a sturdy tree called Ugandan ironwood – perhaps suggesting firm is best, or more likely, firm branches prevent a weak branch breaking and leaving the chimp vulnerable to predators. Instinctive sleeping and resting postures: an anthropological and zoological approach to treatment of low back and joint pain by Michael Tetley, PT. The article suggests that we are too far removed from our primate origin. I remember my youth spent sleeping under the stars in nothing but a sleeping bag. Now, in my forties, I’d find it hard to relax and sleep on a hard floor, let alone a forest floor, or tree branch! When you lie down on a hard, flat floor you will immediately feel all your tension (try it). Once you sense your tightness, you can do something about it and let go the areas that are holding stress and rigidity and release the stiffness. When you get down on the floor, something has to give, and it’s not going to be the floor; that’s for sure! Think of the floor as your personal biofeedback device. Use your breathing to release tension and encourage relaxation. 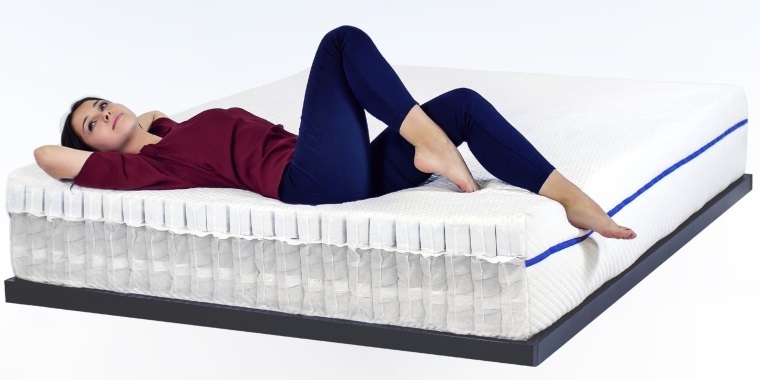 So what type of mattress is best? Choose whatever gets you a good nights sleep, but I’m in love with my Sleepovation! It is clear that sedentary ‘civilized’ people likely have much higher incidence of musculo-skeletal lesions (especially low back pain) compared with native peoples, nomads and forest dwellers. Anecdotal evidence suggests that low back pain and joint stiffness is markedly reduced by adopting natural sleeping postures. One such position, uses a rotated arm as a pillow when side-lying. This allows you to listen out for danger with both ears. Note, that even the Chimpanzee sleeping position is remarkable similar to this ‘best’ sleeping position. When lying on one side you do not even need to use your arm as a pillow. When your lower shoulder is fully hunched, the neck is supported. The neck then gently deviates towards the ground and gravity shuts the mouth (preventing insects from crawling in), and a slight traction and elongation is applied to the cervical spine. Further research on instinctive sleeping is needed. 3. Stomach Sleepers – avoid – stomach sleeping twists your neck and spinal cord 90 degrees! Anyone else trying instinctive sleeping without pillows?